One of the things I hear over and over in the middle school is teachers complaining that their students just don't study. I hear you say that you provided them with interactive notes and maybe even a study guide. You told them to write "study for the test" in their assignment notebooks. Why do they still fail? Because they don't know how to study. My teaching tip today is that we, as teachers, have to remember that our students are not atomically going to know what we mean when we tell them to study. If we want them to do it, we need to teach them how! How soon should they start? This stuff seems like common sense to us (because we're all skilled at this whole education game), but it's not so for our students. 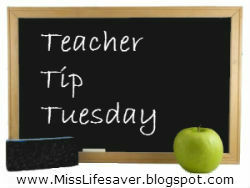 I have learned that it's necessary to take instructional time to show my students how to study effectively. Let me give you an example. I've already mentioned how I introduce my students to vocabulary using an Own-A-Word (OAW) method. As students gather definitions from the presentations, they record the information on index cards. We then use these index cards for review games (which I will disclose in a future post) and for studying. Round 1: Partner A says & shows the word, definition, and word again. Partner B repeats the definition. Round 2: Partner A says and shows only the word. Partner B recalls the definition. Round 3: Partner A says & shows the definition, word, and definition again. Partner B repeats the vocabulary word. Round 4: Partner A says and shows the definition. Partner B recalls the vocabulary word. After I teach students how to do each round, they can practice on their own during centers with a poster as a guide. It helps a lot of my students to hear and see the words & definitions multiple times, and they love to coach each other when they hear a wrong answer. Just remember that just because they know how to study for one type of assessment, it doesn't mean that they know how to study for them all. If you have any other ways to TEACH studying, can you let me know. I have been searching high and low for ideas.